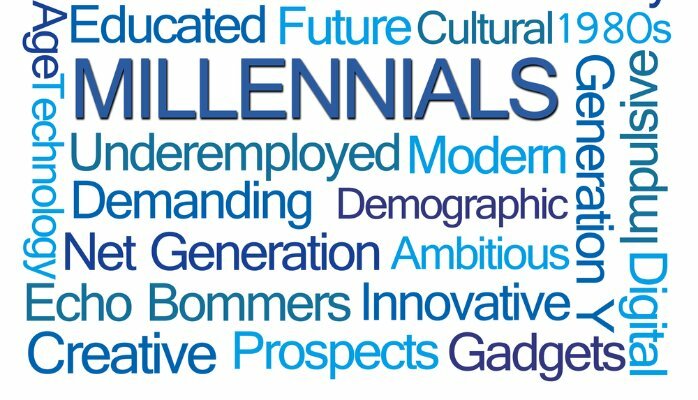 “Millennials” are defined by Time Magazine as those individuals born between 1980-2000 and this group has been the focus of cultural distain on a number of dimensions. 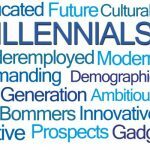 However, the Center for Disease Control and Prevention’s (CDC) website has population data visualizations both in reports and outside of reports which seem the cause for some celebration of the teen millennials. 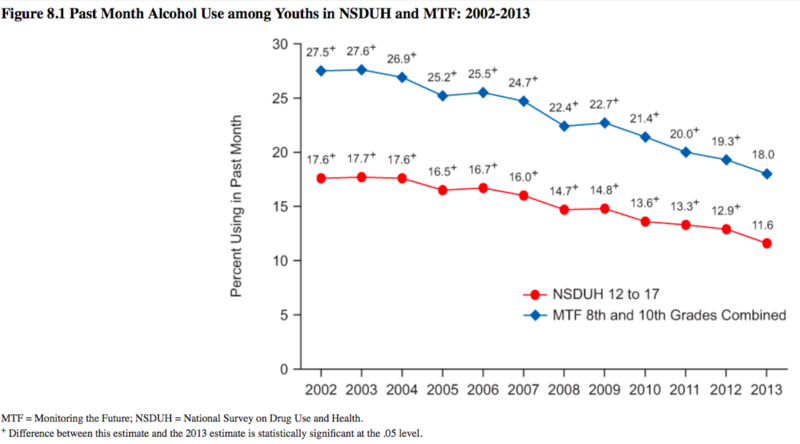 The graphs below are from the CDC website, http://www.cdc.gov/ accessed 07/04/2016 and document meaningful decrements in teen alcohol and marijuana use, tobacco smoking, use of non-medical psychotherapeutics and births to teenage mothers. Clearly there are a myriad of additional health issues germane to this generation as well as the younger and older generations (e.g., domestic violence, unwanted sexual contact and exploitation, intimate partner violence, human trafficking, homelessness), but these findings may portend better adult health among this much maligned generation and in so far as substance abuse and teen parenthood may be on the causal pathway to some of the other health issues listed, these findings may be all the more important. 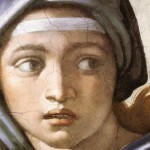 Legend: Secular charges among United States millennial (i.e. defined by Time Magazine as individuals born between 1980 – 2000) teens. 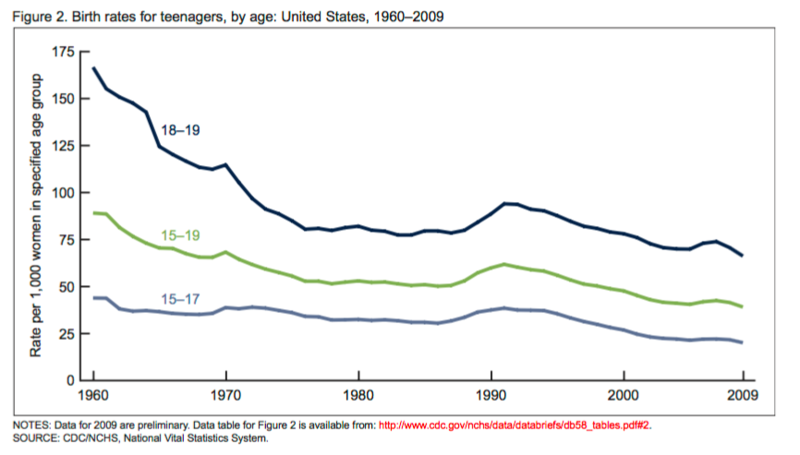 The graph shows the results of a national survey administered yearly between 2010 – 2014 by the Center for Behavioral for Health Statistics and Quality to kids aged 12 – 17. 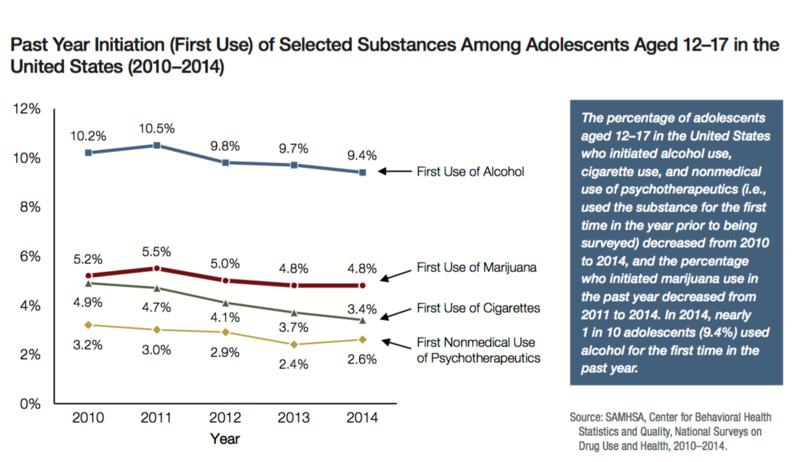 Declining rates of initial use of a variety of substances in the year prior to the survey is evident in each group. 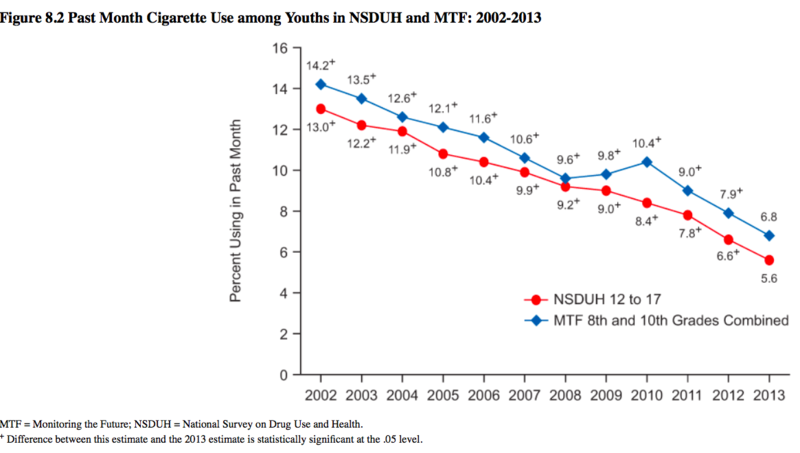 Legend: Figures 8.1 and 8.2 show concordance of two national data sources, Monitoring the Future (MTF) and National Survey on Drug Use and Health (NSDUH), among teens between the years 2002 – 2012 with respect to decrease in use of alcohol and cigarette in the month prior to survey. Legend: Figure 3 is from the National Vital Statistics Reports, Vol. 64, No. 2, December 23, 2015, page 5. It shows that among babies born between 1960 and 2014, the proportion born to teenage women 15-19 has decreased substantially.